It’s amazing what you can get out of a single photograph sometimes, especially when you’re enamored by the primary subject matter! 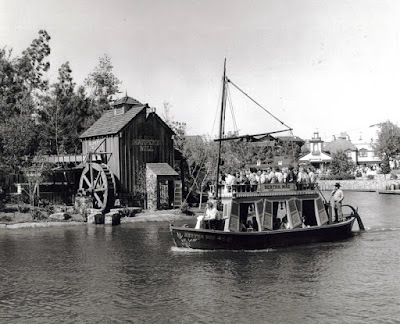 Such is the case with the picture of one of the keel boats, the Bertha Mae, which was part of the Mike Fink Keel Boats attraction that plied the Rivers of America once upon a time. Finding such a beauty is treasure enough, but if we take some time to truly explore this picture from 1976 we’ll find a few hidden treasures as well. Let’s start with the obvious, the Bertha Mae. One of the two ships to make up the Mike Fink Keel, the other being the Gullywhumper, the Bertha Mae was, shall we say, the lovelier of the two ships. A vessel of the same name was originally featured on the episode of Disneyland entitled Davy Crockett’s Keelboat Race on November 16, 1955. In the episode Davy teams up with Cap’n Cobb to race Mike Fink and the crew of the Gullywhumper from Kentucky down to New Orleans. What follows are river hijinks and espionage that ends with Davy besting Fink, but the two form a slightly bewildering friendship. The Mick Fink Keel Boats attraction originally boarded in Liberty Square, down beneath the carriage house now associated with the Haunted Mansion. 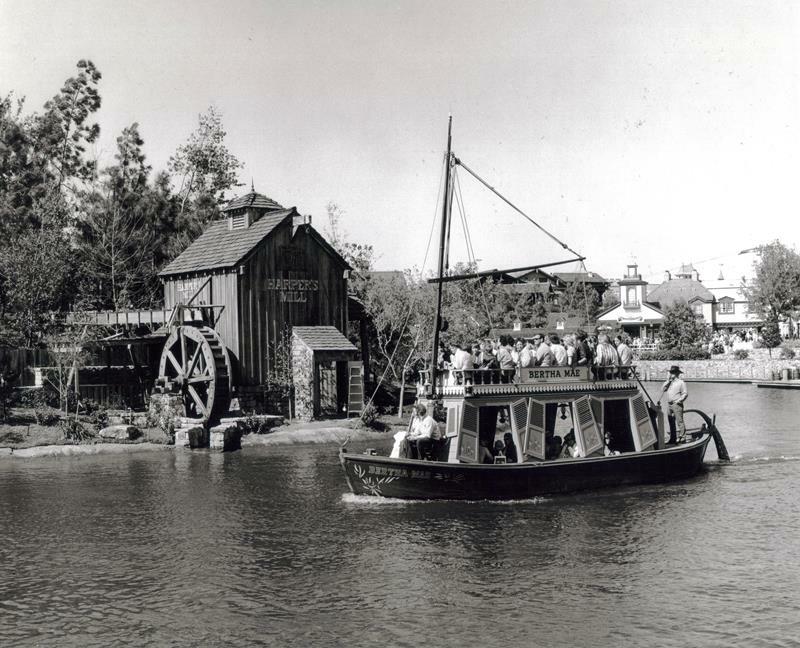 It would later receive a dock in Frontierland as well. This second dock is still standing, though not in use, and you can still see Mike’s name on the boards if you’re looking from the side of the Liberty Belle or from Tom Sawyer’s Island. The free floating keel boats were an opening day B-Ticket attraction at the Magic Kingdom. They would take their last trip around the river bend in April of 2001. Let’s start digging through some of the other details. We always talk about how the artifacts that are strewn about the various lands and attractions of Walt Disney World give these places a sense of life. Typically, when it comes to looking over at Harper’s Mill, we think about the raft next to it. In this photo, however, we see that the storage area of the shed is actually open and there is a ladder leaning against one door. Clearly there is some work happening around the mill today. Moving back over to Liberty Square, you can see a line of people queued up in front of The Yankee Trader. Could they be waiting to get into the Haunted Mansion or waiting for their turn on the Gullywhumper or Bertha Mae? Either is possible given the location of the crowd, but the Haunted Mansion is more likely. The romantic in me hopes it was for a cruise aboard the double-decker keel boats. Further beyond The Yankee Trader, the foliage that divides Liberty Square and Fantasyland hasn’t yet created a natural barrier between the two lands. The happy coincidence from this lack of greenery is that we can see the side of the Swiss chalet that was home to the Skyway to Tomorrowland. In fact, as the trees and shrubs would grow up, much of the detail that can be seen here (and it is limited to do the distance the photograph was taken from) would have been swallowed up and very rarely seen, except by those in line for a ride aboard the Skyway. A section of the Skyway can even be glimpsed above and behind The Yankee Trader and Columbia Harbour House. Photographs of extinct attractions are wonderful time capsules into the past of Walt Disney World. They remind us of beloved attractions and the stories they themselves harkened back to. We are given a sense of what the lay of the land was like in days when we were younger or, perhaps, not even alive to visit the parks and resorts. These pictures also remind us that Walt Disney World is ever-changing, even when exploring the world of yesterday. The Bertha Mae and Gullywhumper keel boats where a wonderful part of my child, as they were for many of you who also adored Davy Crockett. From this photograph, it is easy to see that they had a wonderful perspective on the Magic Kingdom as well.